During development of new polymers you can simulate the influence of different forms of MWD's or branching degrees. Also you get accurate information for engineering and design use such as viscosity at high shear rates. You can draw or import MWD data of GPC or SEC and use earlier data as repository during polymer tailoring by simulation or for other RheoPower programs. Respectively the main tool bar of RheoDeveloper and MWD-viscosity chart are shown in front of the figure. You can adjust the elasticity by P'and viscosity by P'' of polymer. General information on MWD influences. Data feeder for third party flow modeling software. Design aid for new polymers and extrusion processes. Design aid for extrusion dies. General knowledge of relations and structure. Elastic and viscous component values gained with RheoAnalyzer. Structure and flow factors of polymer or material and one data point of viscosity. We modell the transient viscosity, deeper explanation is found in our published manuscripts, Part III. 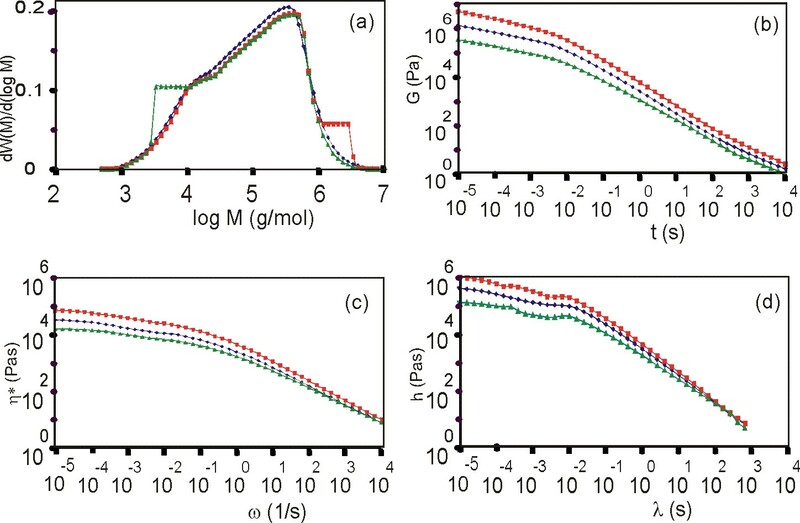 Modelled transient viscosity over a wide range of new shear viscosity values for LDPE from the steady and effective shear rate 1/s. - Click on the figure to zoom it. 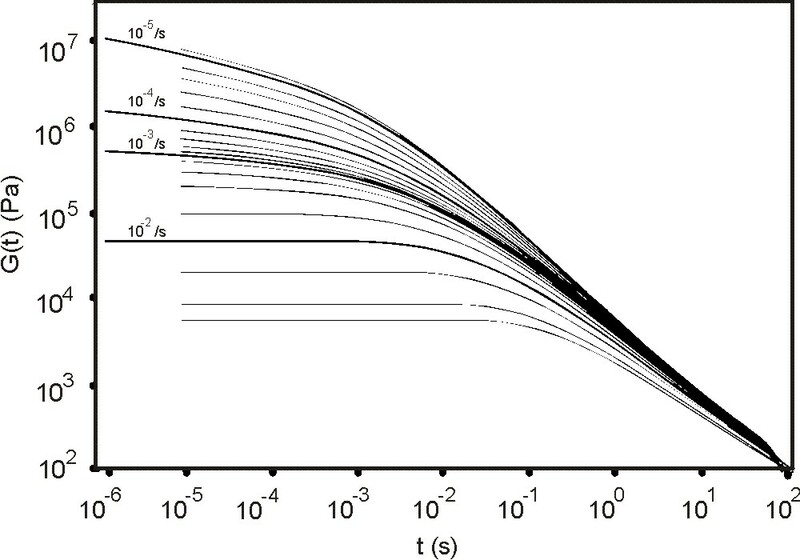 Figure shows simulated results a fully relaxed polymer on a wider range of new shear rates. 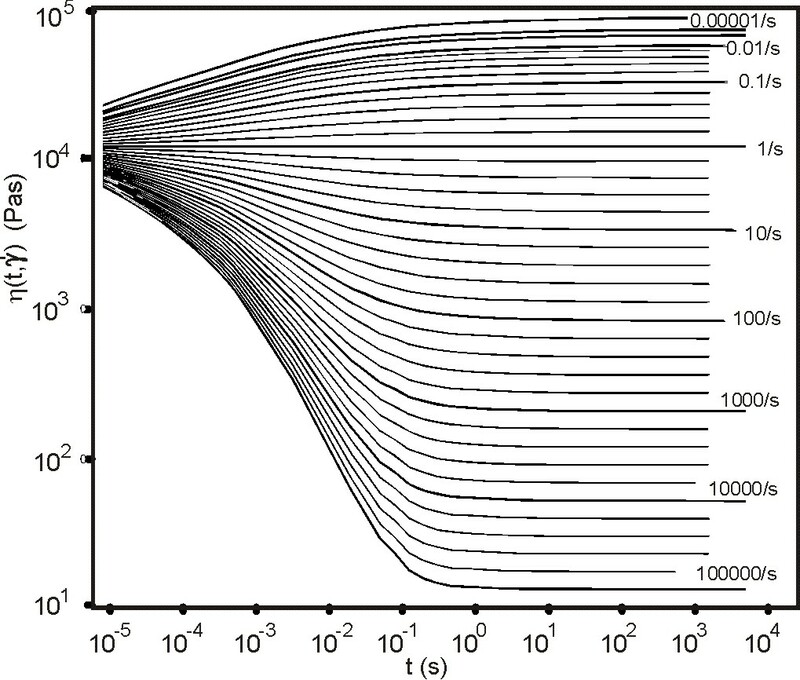 Modelled start-up viscosity curves of IUPAC A LDPE at new induced lower and higher shear rates. The lower thick line corresponds to the induced 1/s shear rate. The upper thicker line was calculated from the relaxation modulus using the classical equation. - Click on the figure to zoom it. Relaxation modulus can be simulated for the polymer with a different shear history for the respective shear rate at the beginnig. Not only the shear history but also the imposed-ramp strain affects the molecular orientation, and during practical tests the polymer always exhibits a higher effective shear rate, giving a lower effective viscosity. - Click on the figure to zoom it. 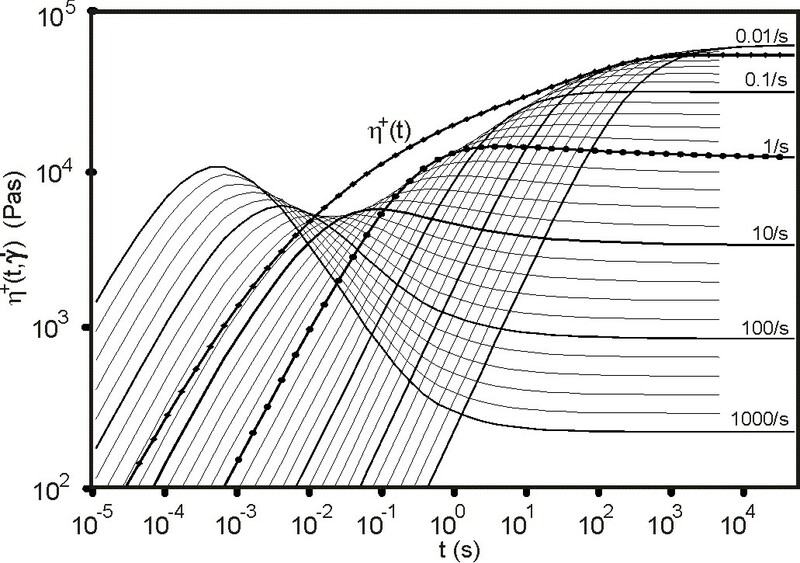 Simulated relaxation modulus at different effective shear rates related to effective zero relaxation modulus. - Click on the figure to zoom it. 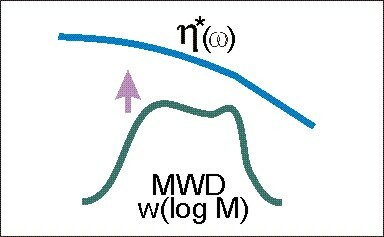 Other properties and the influence of changes in the MWD on the behavior can be simulated using what-if analyses. This enables the background of principle, where is possible to compute to the both directions. What-if analyses for Lupolen 1840H LDPE reveals large changes in modelled viscosity, relaxation modulus, and spectrum. - Click on the figure to zoom it.